2 Chambre, condo de coin 20 pas de la plage ... En bord de mer! Une touche de vieux Hawaii ... ce charmant, confortable, à jour, condo de coin de 2 chambres est situé au rez-de-chaussée de l'unité de deux étages Pikake Condominiums à Honokowai. Pas de longues randonnées depuis le parking ... notre parking est proche de notre porte d'entrée. La plage et l'océan sont à seulement 20 pas de la porte arrière (lanai) pour la baignade et la plongée en apnée. La vue de la véranda est magnifique ... vous pouvez voir Molokai, Lanai et beaux couchers de soleil sans parler des tortues de mer, des dauphins, et bien sûr les baleines à bosse à la fin de l'hiver / printemps. Nous sommes nichés entre les complexes hôteliers de Ka'anapali et Kapalua, non loin de Lahaina, de sorte que toutes les activités possibles, visites, magasins, restaurants sont à votre portée. Honokowai Beach Park est à distance de marche et a une belle aire de jeux pour les enfants. La beauté de la copropriété est que vous pouvez aller profiter de toutes les activités dans les centres de villégiature, mais vous pouvez retourner dans le condo pour s'éloigner de l'agitation. Il n'y a pas beaucoup de ces sortes d'endroits autour et nous aimerions le partager avec vous. Nous sommes juste la bonne taille pour une famille ou deux couples et même les jeunes mariés! Overall we had a great time. My grandkids loved the private beach in front of the property. While at the property, we saw whales far out in the horizon. We also saw turtles close to the property sea walls. The unit had the best sofa bed we ever slept on. The single beds were a little too soft for us. The kids enjoyed the sunsets and blowing the conch shells at sunset every night. We had a great stay. The place was clean and tidy. We had everything we needed including beach towels. Amy was so easy to work with and super responsive when we reached out. The option to use the laundry facility was great. It was 2.00 to wash and 1.50 to dry. We had to go for cash/change which is why I am mentioning it here. The condo is located in a great middle location. The turtles outside were the highlight of our trip. Every afternoon we would sit outside and watch them in the water and some even came up on the shore. We also saw whales just outside our door. I would have given it 5 stars but I had to deduct one because the neighbors above us were super noisy and insensitive to us, the lower neighbors. They would go to bed late and even got up at 330 one morning. I didn’t realize that there was a possibility of someone being above us so that is also why I am mentioning it here. Well maintained condo with everything you need for a stay. Didn’t even realize until the last day there was lawn chairs. The location is unbeatable. Walk out the patio doors to the beach. See the turtles sleeping on the beach almost every day. Location is terrific, accommodations are comfortable, weather was cooler than usual this February, but still came home with a tan. Thank you Amy for sharing your beautiful condo with us. 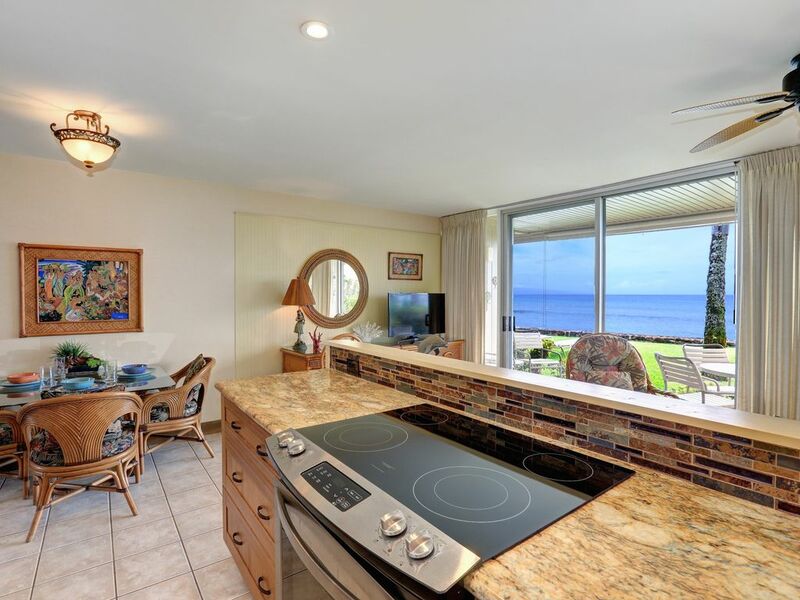 We have stayed at four VRBO rentals beach-side in the same area (twice at Pikake and twice at Hale Mahina a few doors down the street) over the last 3 years, and this condo was the most comfortable. The kitchen was well equipped, the furniture was in great condition, the beds were comfortable, and the unit included 2 beach chairs, umbrella, and coolers. There was also a bin of snorkel gear but we decided to rent our own as I required an exact fit. The convenient fridge ice maker saved us multiple trips to the grocery store! The views were outstanding and we had multiple turtles sun themselves on our semi-private beach over our two week stay. It is very rare to find a 2 bedroom, multiple bathroom (1.5) right on the beach, so we consider ourselves very fortunate to have met the owner last year when we stayed in the unit next door, and she invited us to tour the unit. We love the convenience of the ground level unit where you can walk out carrying your drinks/snacks to watch the amazing sunsets, reclining in the lounge chairs. There are only 12 units in total at the Pikake, so we appreciated the quiet and zen-like atmosphere where we spent hours just watching the water and listening to the surf. Thank you again for the wonderful stay! I have to admit at the outset that I am part of the owner's family. I have been traveling to Maui for over 40 years. I have had the privilege of staying in many nice places for vacations, but this is one of the nicest. As the photo shows, the condo is right on the water, your view framed by palm trees. As the end unit on the main floor, you get additional patio space. The kitchen and main bath have been renovated recently using nice quality materials. Everything is open and airy, which is crucial in a tropical environment. There is little better in the world than to sit outside and eat breakfast as the sun starts to highlight Lanai and Molokai in the distance, except to have sundowner mai tais on the porch while the sun sets in the ocean between the islands. One of our favorite post dinner activities is to sit together on the beach loungers and watch the stars at night. Fabulous!! Walking distance to healthy food market, the fish market, tacos, coffee, etc. The road has minimal traffic as it is not the main road to the rest of the island (it used to be, but now most traffic to Kapalua, etc., takes the upper road, leaving the lower road only as an alternative, with its 25 mph speed limit!) Can't wait to go back.